Pour the whiskey into a glass with ice. Fill it with Collins mix. 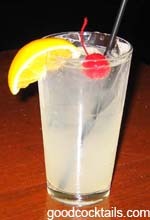 This is like a Tom Collins but instead of gin you use whiskey (bourbon).